A lot of things about Millennial culture leave older generations scratching their heads. Here’s another one: They are moving to Buffalo. Redefining the American Dream means Millennials are moving to smaller cities their parents would have scoffed at in their 20s. But it fits in with the monetary worldview of this younger generation of adults. The Great Recession left many Millennials jobless or underemployed and with thousands of dollars in student loan debt. They were told again and again not to worry too much about taking on loans because an education meant a good job. Unfortunately, that hasn’t happened for a lot of them. So, many of them have moved somewhere cheap and started a career in something they are passionate about. 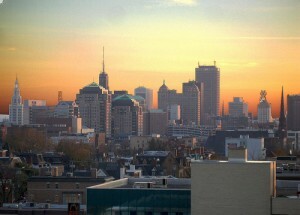 Buffalo, seen here without snow, is an attractive place for young people. That’s what the Gothamist found out when it followed around a few Millennials living in Buffalo. One 28-year-old, Bernice Radle, ditched the music scene in Los Angeles, bought a 1,600 square foot for $16,000 and joined other young preservationists in restoring some of the city’s historic homes. The pattern is happening across the country in “second-tier” cities like Portland, Baltimore, Minneapolis and Buffalo. Even cities such as Cleveland and Detroit, where people have moved away in drowth, are seeing a growth in their young population. These new “cool” cities offer an affordable chance to live an authentic city lifestyle and have social scenes that continue to grow as more young people move in. The Christian Science Monitor reports that St. Louis, for example, saw a 138 percent increase of educated 25-to-34-year-olds living in its city between 2000 and 2012. Nashville had a 37 percent increase in its population of people born between 1977 and 1992 between 2007 and 2013. Millennials are sometimes derided for their attitudes when it comes to money, but they at least make the effort to afford the life they live. They want to enjoy life when they’re young and want to start a career they enjoy, but that high student loan debt means they’re cautious about borrowing or racking up credit. CNN Money used a Bankrate survey in September to report that 63 percent of Millennials don’t own a single credit card. Instead, young people prefer debit cards and cash so they can better manage what money they have. It might take a little bit of creativity, but living within their means just makes sense for this generation — especially if they can do it in Buffalo.